Despite selling only a limited selection of high-end smartphones, Apple may soon ship more total handsets than Nokia —which still offers more than two dozen models, including cheaper feature phones —as the once-mighty Finnish company falls even further from its throne. 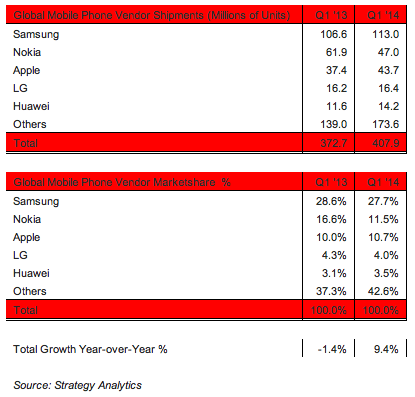 Nokia's mobile phone shipments dropped by 14.9 million units to just 47 million in the first quarter of 2014, according to new data from market research firm Strategy Analytics. Apple, in comparison, shipped 6.3 million more iPhones than it did the year before to end its own fiscal quarter with sales of 43.7 million devices. That means Nokia's 50-year-old mobile business, which once had a near-monopoly on the handset market, finds itself in a dead heat with Apple and its own 7-year-old mobile platform. Nokia commands 11.5 percent of the global market compared to 10.7 percent for Apple's iPhone line. "Apple has closed the marketshare gap on Nokia to just one point, and Nokia will have to fight hard to stay ahead in the second half of this year," Strategy Analytics senior analyst Ken Hyers said. The news is particularly troubling for Nokia because the vast majority of the company's handset sales come in the developing world from feature phones and the low-cost Asha series. Nokia's 220 feature phone, for instance, costs just $60 even without carrier subsidies. It is not yet known what Microsoft, which closed its acquisition of Nokia's handset business earlier this week, will do with the lower-tier handset divisions. Some believe the company may choose to shutter the feature phone business and focus solely on touchscreen devices running Windows Phone in a bid to counter Android's rapid proliferation in the low end of the market.